The defending DTM champion Rene Rast made one more huge step on his way to enter the season’s finale as one of the title contenders. After he won both races in the previous round at Nürburgring, Rast dominated this weekend at Red Bull Ring and added two more wins on his account. The 31-year-old driver in the #33 Audi RS5 DTM is now third in the championship standings, thirty points (229:199) behind leader Paul di Resta (Mercedes). Between the two of them, there is Gary Paffett with 225 points. In the first race, Rast inherited a victory after pole-sitter and leader Dani Juncadella received a time-penalty because of a jump start at the last-lap restart following a Safety Car period. In the last lap, Mike Rockenfeller (Audi) was in front of Rene Rast but, like a good teammate, he gave a position to a colleague who still has a chance to win the championship. 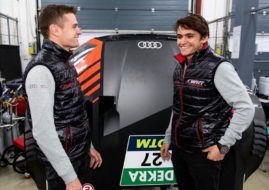 Together with Rast and Rockenfeller, Nico Muller climbed to a podium to give Audi a 1-2-3 victory. In Sunday’s race, Gary Paffett started from pole but he didn’t manage to finish better than third, behind two Audi drivers Rene Rast and Nico Muller. Paul di Resta finished fourth in both races to defend his championship lead ahead of season’s finale at Hockenheimring. The guest driver at Sielberg’s round was the ive-time world rally champion Sebastien Ogier, who was driving the #17 Mercedes-AMG C63 DTM. He finished 12th in Race 1 and 16th in Race 2. The last two races of the season are on the schedule on October 13-14.